It is said that the numbers of the once prominent Jewish community in Yemen are dwindling fast, especially after the revolution during which a number of Jews had to flee from hostility in the northern province of Sa’ada. The number of Jews left in the country isn’t known with precision but government sources estimate it at 450 and Jewish organizations in the United States estimate at slightly over a hundred. Jewish history in Yemen however, goes back to the year 1451 BC as reported by Arab historians from medieval times and legends still circulate that they settled in the Arabian Peninsula around the times of King Solomon. What was once a prosperous community, heirs to unique cultural traditions, is today an impoverished and rather marginal group among others in the complex map of Yemen’s multilayered cultural landscape. From the cultural legacy of Yemeni Jewry it seems that there is one part that stood the test of time, migrations and revolutions: The craft of hand-made silver jewelry. Last year in December, Yemeni silversmith Kamal Rubaih and retired American diplomat Marjorie Ransom presented a selection of Yemeni jewelry at the Library of the Congress in Washington, focusing on Jewish designs. In his shop “World Friend” located in the old silver market in Sana’a, Rubaih collects jewelry in both traditional Jewish and Muslim designs. 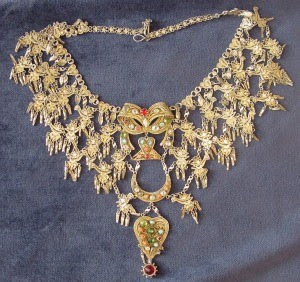 According to Rubaih, from the great variety of traditional jewelry made in the country the most exquisite was done by the Jewish silversmiths in the northern mountains and in the large cities, alongside Muslim jewelry from Tihama, the Hadramaut and Mahra, where Indian influence was felt strongly. Yemeni brides always felt a strong preference for the Jewish jewelry that is considered an icon of wealth and beauty and it is said that until the 1960’s, it was a deep-seated tradition for Muslims to give a dowry in Jewish jewelry. At the silver market in Sana’a both Jewish and Muslim silversmiths worked alongside and their relations were always cordial and peaceful. However, the ancient Jewish craft has declined progressively as more and more Jews left the country or no longer practiced the craft. On the Muslim side, only a few silversmiths remain but some of them are working on the recreating the traditional Jewish practice. Mrs. Ransom is a long-time collector of Middle Eastern jewelry since she was a graduate student studying Arabic in Damascus, and her collection now amounts to over a thousand pieces collected from every corner of the Middle East in over forty years. A part of her collection was showcased in 2003 in the exhibition “Silver Speaks: The Traditional Silver Jewelry of the Middle East” at the Bead Museum in Washington, D.C.
Over the years of traveling and collecting, she has become an expert on the cultural traditions of the region through studying the jewelry, interviewing people about the usage and reading everything on the topic, learning that way the history and culture of the region like very few, through the traditional crafts. Ransom and Rubaih have collaborated on the book “The Demise of an Ancient Craft”, to be published this year by the American University in Cairo Press. The book will deal with jewelry from all of Yemen, with particular attention to the now forgotten topic of the Jewish silversmith. The traditional silversmith of the Middle East – including Turkey and Iran – has been replaced by gold jewelry, much of it imported and not handcrafted, thus, the efforts of Rubaih to keep the ancient craft alive are certainly remarkable. The larger repertory of styles and techniques in Middle Eastern silver jewelry – casting, chasing, embossing, repousse, filigree and granulation among others – has been mostly casted asides to the work of a few artisans and the constant unrest and deteriorating economic situation have chased away most of the potential customers in the Western world that were delighted to collect the pieces in previous decades. Among the regional styles, however, some are distinctive and unmistakable, such as the Jewish silversmith craft from Yemen, using highly skilled techniques – filigree, granulation and geometric shapes applied to flat surfaces, producing rich layers of adornment. Rubaih has performed an exceptional task in preserving alive in his shop, traditional pieces recreating the ancient Jewish craft that is one among other timeless and important features of the rich and diverse Yemeni heritage. According to Rubaih, only very few Jewish silversmiths remain in the country and are now in very old age, but that hasn’t deterred Muslim artisans from learning the craft and reproducing contemporary pieces in the traditional style. He says that now Yemeni women prefer to wear gold than silver and thus, there are only very few working in the trade that has mostly tourists as their customers, but with an entire year of unrest and soaring unemployment, this hardly suffices to keep the craft alive. Unless there is an effort on the part of the Yemeni government to support traditional silversmiths as well as other artisans working with traditional crafts – weaving, embroidery, pottery and the like, Rubaih insists that it is very likely that they will disappear very soon and with them, an ancient heritage spanning sometimes into thousands of years. Mrs. Ransom was able to travel through Yemen for an entire year and met a small number of Yemenis working with traditional techniques and crafts. It turns out that there are younger artisans, offspring of the elderly silversmiths, who are trained in the craft and said that they would like to take it up if it were possible for them to make a living with it. She even found the son of an indigo dyer – a technique that has been picked up recently in haute couture in Europe – who also would like to take up the craft if an opportunity would arise for him. In the 1960’s the legendary cultural critic Susan Sontag wrote that “every era has to reinvent the project of spirituality for itself and in the modern era, one of the most active metaphors for the spiritual project is art”. Art always comes with a Janus-face, looking always into the past – the great things that men made then – and into the future – keeping whatever it is that is worth keeping, and is hardly strangled by the demands of the hostile present. In spite of unrest and an entire year of an unfinished revolution, Yemenis are still clinging to the privilege of the heritage and this isn’t only a matter of nostalgia – a sentiment always reactionary and inimical to progress – but a vision of a better future safely anchored in the scandalous strength of the past, or in the words of Virginia Woolf: “The present when backed by the past is a thousand times deeper than the present when it presses so close that you feel nothing”. But if you find yourself going off on long tangents about personal matters, it's time to get back on track. This also depends on your own personality, your niche and the audience you are targeting. If you would think twice before saying something in a phone call or email to a customer, you should leave it out of your blog. With a little bit more research and time from you, we are sure you'll come up with a profit-building blogging strategy!